Nail Of The Day: Bright Neon Green and Black + Konad! I hope you are all having a rockin' day so far. I woke up super early this morning (7 AM!) and was instantly hit by this rush to do some Konad. Oh my goodness, not only am I a makeup addict, I am truly becoming a Konad addict as well-I live it, and breathe it! hahaha ok, just kidding! 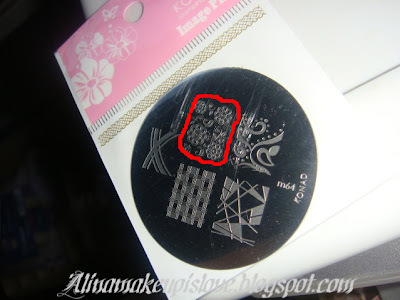 But I did come up with a super cute Konad flower print design. 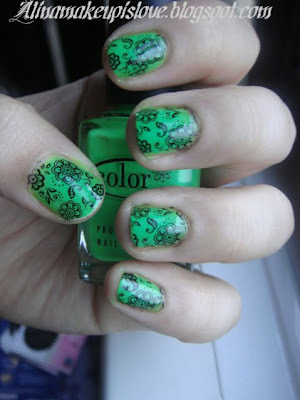 For the neon green base color, I used 2 coats of Color Club nail polish in 'Limelight'. Limelight is an insanely bright, neon green color that sadly was not captured true to color on my camera. This color is gorgeous for summer! I have had this polish for awhile now and I never really rocked it until now...boy was I missing out. This polish applied really nicely-no streaks, or air bubbles, and I love the fact that this nail polish dries super fast as well. I used a cute, retro flower image from Konad image plate m64. For the black polish I used Konad Special Polish in black. And I sealed everything with Konad clear top coat. Here are some pictures (click images for enlargement). I hope you all enjoy, and Thank You all so much for stopping by! Disclaimer: I am not affiliated with Konad in any way. I purchased all of these products mentioned above with my money, for my personal use.